The Kerferd Road Pier, Albert Park, is a timber construction built between 1887 and 1889 to a design by the Public Works Department. It is a wide jetty formed of timber pylons supporting timber cross members. The balustrading and decking are also of timber. The pier remains substantially intact in its original form, though a steel mesh landing platform has been added at the western extremity. Some deck timbers have been replaced. Asphalt, which had been laid over the decking at some time in the past, has been removed. Timber bollards at the seaward end of the pier are weathered. This site is the traditional land of the Kulin nation. The Kerferd Road Pier, Albert Park, is of historical, architectural and archaeological significance to the State of Victoria. 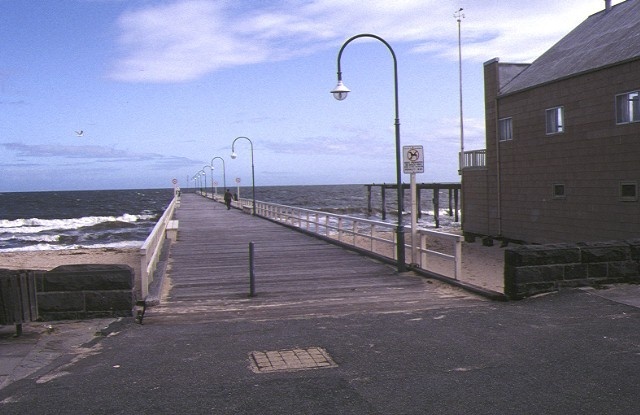 The Kerferd Road Pier, Albert Park, is of historical and architectural significance as a rare example of a substantially intact nineteenth century pier in Port Phillip Bay. It retains important elements of its original construction and is a rare example of a pier built predominantly for recreational purposes. The Kerferd Road Pier is of historical significance for its role in the development of the Albert Park foreshore as a fashionable seaside resort and in the growth of sea-bathing as a popular recreational activity in the late nineteenth and early twentieth centuries. 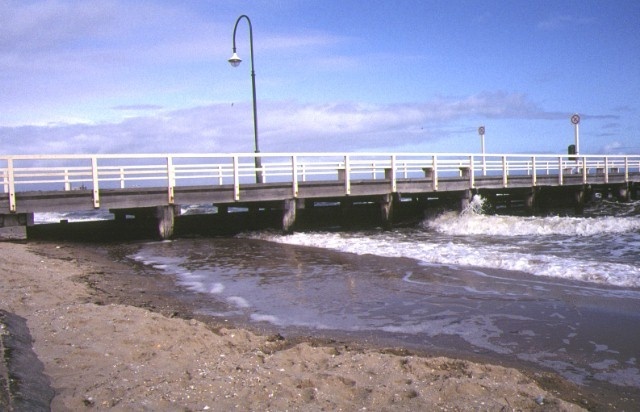 The pier at Albert Park is a surviving vestige of the extensive infrastructure associated with the swimming baths and beachfront recreation along this part of the foreshore. 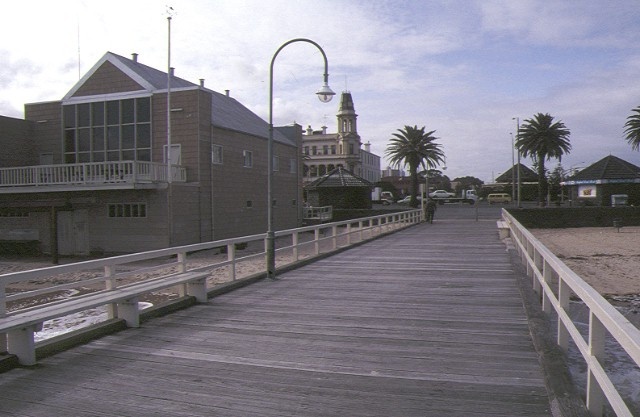 The pier has a relationship with other sites of historical significance for their role in the development of seaside recreation in the area, such as the Victoria Hotel, VHR 0820. It remains an important local landmark. The Kerferd Road Pier and the seabed beneath and surrounding it are of archaeological significance for their potential to reveal artefacts scattered by users of the pier and adjacent beach facilities since the 1880s. It is significant that the seabed surrounding the pier has not been dredged therefore increasing the archaeological potential of the site. As Executive Director for the purpose of the Heritage Act 1995, I give notice under section 46 that the Victorian Heritage Register is amended by amending Heritage Register Number 1534 in the category described as Heritage Place/Archaeological Place. 1. 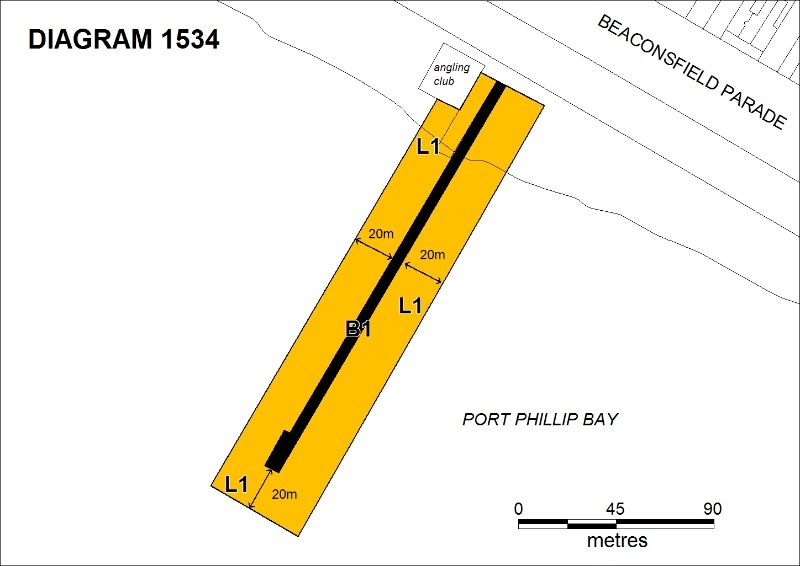 All of the land marked L1 on Diagram 1534 held by the Executive Director, including part of Crown Allotment 29B, Section 92, Township City of South Melbourne, Parish of Melbourne South. 2. All of the building marked B1 on Diagram 1534 held by the Executive Director. Although Emerald Hill (named South Melbourne after 1883) had developed as a largely industrial town on the south side of the Yarra River from the 1850s, from the 1860s the Albert Park area began to develop as a residential area. This development grew more rapidly in the boom years of the 1880s when the neighbouring Middle Park area also began to develop. In 1873 the first of three enclosed sea baths was opened at the beach at South Melbourne. This was during a period of enhanced appreciation of the health and recreational benefits of fresh sea air and saltwater. Gentle exercise, such as bathing within enclosed seabaths or promenading by the seaside or along a pier, was regarded as healthy and restful recreation. Enclosed baths offered a safe environment in which to enjoy bathing. But they were also a necessity at a time when open sea bathing was prohibited in Victoria on the grounds of modesty. Ladies sea baths were opened in 1876 at Emerald Hill. A third seabathing establishment opened in 1884 (Priestley, p. 199). The Ladies Baths were enlarged in 1889, just as the Kerferd Road Pier was being completed. The original Emerald Hill Sea Bathing Company's Baths were renamed the Tramway Baths in 1890. Following English fashion, established in the eighteenth century, piers formed an integral part of the nineteenth century sea resort. Victorians enjoyed increased leisure time during the 1880s, a time when several developing seaside suburbs were marketed as 'resorts' by private companies. Some piers built in association with these resorts were privately-funded. The Victorian Government shared with the South Melbourne Council the cost of building Beaconsfield Parade as a promenade from 1887( Priestley, p.201). The Hotel Victoria (H0820), a resort hotel, was constructed on Beaconsfield Parade opposite the new pier in 1888. In 1890 a cable tram service began operating from Melbourne to the beach at Albert Park, making the beach here accessible not only to day-trippers, but also to those seeking relief from Melbourne's heat on summer evenings (Priestley, p. 201). Beautification of the beach and the provision of amenities on the foreshore at Albert Park continued in the late 1890s and early twentieth century. A seawall was begun in 1896. A toilet block was constructed at the terminus of Kerferd Road by 1904. A beach shelter, which remains on the foreshore, is evident in a photograph dated circa 1910. This was perhaps constructed by the local Foreshore Trust which was established in 1909. 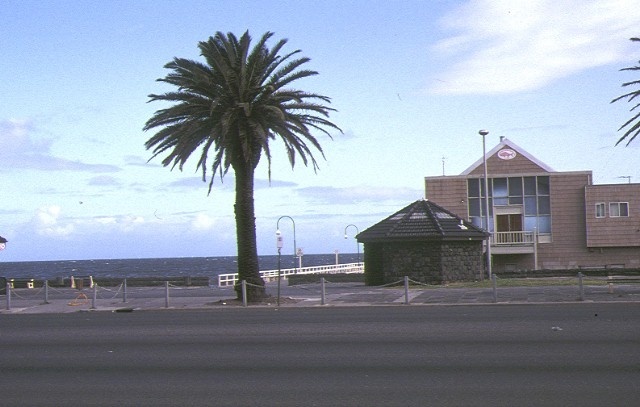 The sea front at South Melbourne was used for defense purposes from the mid-1850s to the 1870s. A defence reserve along the foreshore in the vicinity of the site of Kerferd Road Pier housed a battery for the coastal defence of Melbourne from 1855. This was upgraded with bluestone in 1860 when two further batteries were constructed along the Hobsons Bay shore at the Port Melbourne lagoon and at west St Kilda. A timber barracks in the defence reserve housed soldiers associated with the batteries in the 1860s (Priestley, p. 90). The Victorian Government, using prison labour, began to remove the batteries and clear the roadway along the shore at Emerald Hill in 1878 (Priestley, p. 90). There had been agitation for a pier at Emerald Hill (later South Melbourne) from the early 1870s when the Emerald Hill Town Council had requested the Victorian Government to build a pier in the municipality (Daley, p.141). In 1881 the Council sought and was granted permission from the Melbourne Harbour Trust to construct a pier (MHT Annual Report 1881). It was not until 1887, however, that the Victorian Public Works Department prepared plans for a pier at the end of Kerferd Road and contracted Thomas Dalgleish to construct the approach and first 360 feet of the pier in February 1887 (Victorian Government Gazette 4 March 1887). It was noted in the South Melbourne press that the pier would only 'be useful as a promenade and for mooring small boats' but it was hoped that the pier would be extended into deeper water so that building and road-making material could be lightered across the bay from Williamstown and Footscray for use in the 'southern suburbs (South Melbourne Citizen, 15 January 1887). In December of 1887, W. Tait of Geelong was awarded the contract to extend the pier (South Melbourne Citizen, 31 December 1887). The South Melbourne Citizen predicted that it 'would not be long before the jetty becomes a popular promenade' (South Melbourne Citizen, 31 December 1887). D. Ross won a further contract to extend the pier in April 1889 (Victorian Government Gazette, 12 April 1889). Although there had been hopes that the pier might be used for unloading building material, in 1909, the Melbourne Harbour Trust designated the Kerferd-road pier as 'purely a promenade pier bringing in no revenue to the Trust' (MHT Commissioners' Report 1909, p.11). Predominantly used for recreation, Kerferd Road pier has not had to be modified over time as the working piers in Hobsons Bay have had to be. The approaches to and perimeters of many of these piers have been successively dredged over time to maintain adequate depths of water for berthage. The pier remains substantially intact in its original form, though a steel mesh landing platform has been added at the western extremity. Some deck timbers have been replaced. Asphalt, which had been laid over the decking at some time in the past, has been removed. Timber bollards at the seaward end of the pier are weathered and may be original. The Kerferd Road Pier was one of a few piers that were built largely as recreational piers in Port Phillip Bay in the nineteenth century. Most of these recreational piers were constructed with a view to accommodating bay steamers, as well as promenaders. Other piers were adapted to recreational use in addition to or after they were used for other purposes, such as the landing of cargo and passengers. Some nineteenth century piers, such as that built at Mentone in the 1880s, were later destroyed by storms. There are only remnants of the two jetties built at the Clifton Springs resort (H2088) in the nineteenth century. Other largely recreational piers, such as St Kilda Pier, have been substantially rebuilt in both the nineteenth and twentieth centuries. Altona Pier, which was built at the same time as Kerferd Road Pier, was built by a private company. 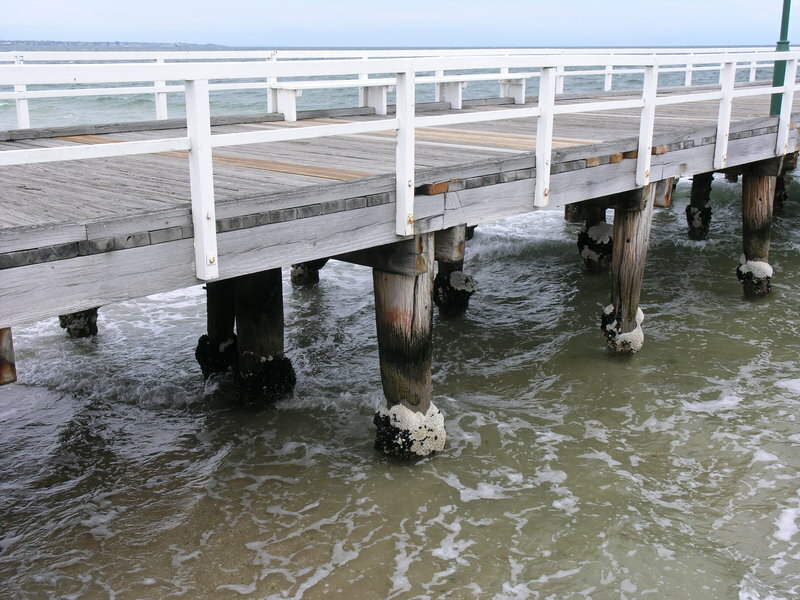 The Kerferd Road pier is a rare surviving example of a relatively intact nineteenth century pier in Port Phillip Bay and a rare example of a pier built predominantly for recreational purposes in nineteenth century Victoria. Criterion C Potential to yield information that will contribute to an understanding of Victoria's cultural history. The Kerferd Road pier is unusual for the fact that its surrounds have not been dredged to increase berthage during the nineteenth and twentieth centuries, nor has the pier itself been substantially rebuilt. This makes the site significant for its potential to yield artefacts that offer insights into nineteenth and twentieth century social history and, possibly, from an early era in Victoria's defence history. Criterion D Importance in demonstrating the principal characteristics of a class of cultural places or objects. 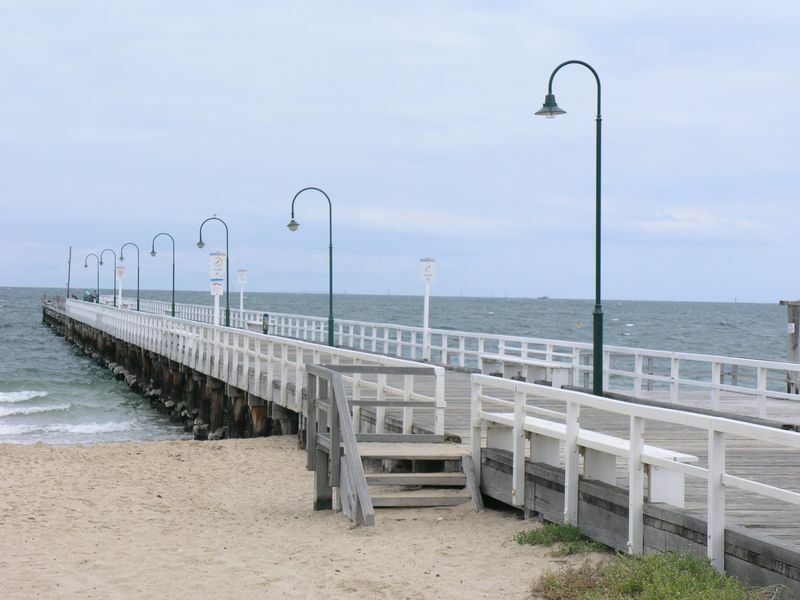 The Kerferd Road Pier is significant as an example of the development of seaside and beach resort culture in late nineteenth century Victoria and as an enduring site for the enjoyment of changing beach culture during the twentieth century. The Kerferd Road beach remains a popular bayside beach for inner Melbourne residents in the twenty-first century. Jill Barnard, Jetties and Piers, 2008, Heritage Council of Victoria. Susan Priestley, South Melbourne, A History, 1995, MUP. Brad Duncan, MIAP Stage One Report, Heritage Victoria, 2003. 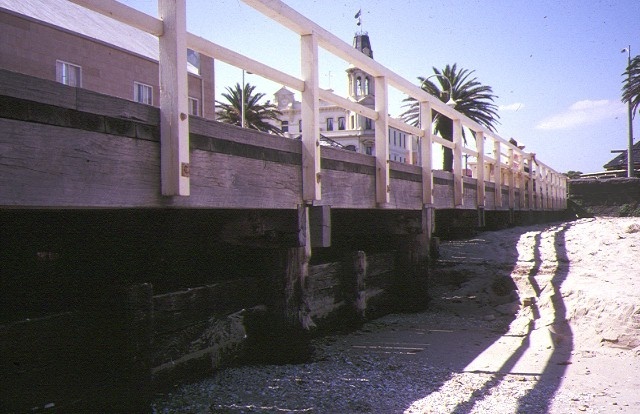 The Kerferd Road Pier is significant as part of the development of the Albert Park foreshore and as one of the few intact nineteenth century piers in Victoria. The pier is a surviving remnant of the infrastructure associated with baths from late nineteenth and early twentieth centuries. It is intended that the registration reinforces the cultural heritage significance of this place and its archaeological potential. The aspects of this place which are important to its significance include its structure and the area of seabed under and surrounding it. Components of the pier - piles, timbers and decking - which are subject to wear, weathering and corrosion have been continuously repaired and replaced since the pier was constructed and this process should be allowed to continue based on the principal of replacing like with like. Previous studies have indicated that artefacts lost or discarded from vessels while moored at jetties and piers can remain in the seabed as archaeological deposits. In the event of any proposed subsurface disturbance of those areas registered under or surrounding the pier, either a preliminary archaeological excavation or a watching brief should be undertaken. In the event of significant subsurface remains being discovered in either of these processes then it may be necessary to undertake a more substantial archaeological excavation. All attempts should be made to retain and conserve any further subsurface material in situ and, where appropriate, to provide suitable interpretation of the material.